@Aaron_Hachmeister_13 I think it stems from it not being mandatory for CIK FIA. Canada likely looks to them in some respects for more input than the US. Hi Kieran, welcome to the forums. I appreciate you taking the time to sign up and respond, however we do like to keep it to discussion rather than promotion of products here. Perhaps you could talk more about how you are measuring safety or where you felt other products were missing the mark? We’d all love to hear more. The new neck brace gives you 360 support like most others device like the motocross ones and some karting ones. Ours not only gives you 360 but also stops your head helmet rolling off the side of it as it connected to the help not your body. It also cannot break on an impact is its all made from advanced foam that is durable with a durable cover. In ways it also acts a cousin or suspension between your head and body. It not only helps in impacts, it also helps your driving performance as it help hold your head up in corners when G- forces are fighting against you. Our testing has shown faster laps times wearing this device over not wearing it. This topic has been whipped to death, without independent testing and (preferably) certification by a governing body, there is no evidence to show a neck brace could help or hinder during an accident. As I’ve said before, the HANS device went through years of independent testing before the FIA made them mandatory. The CIK-FIA investigated neck braces and came to no conclusion. We have spend many years developing and testing different options just becuase a governming body has not test it does not mean its not going to be safe to wear. Also a hans device will not save you in go karting crash. As they are only designed to use with racing belts that karts do not have. A hans device does not give any one 360 support any way its only designed to stop forward impact. It has more vad points the good point about it But im not going to go on as the hans device is not designed for karting so no point discussing it. I believe the point Nik is making is that the FIA, the international sanctioning body for cars, did their own independent testing on the HANS device and agreed that it significantly reduced injuries for drivers and was safer. Therefor they implemented it in the racing series under their control. The CIK-FIA, the branch of the FIA that oversees kart competitions, did similar independent testing with neck braces seen in karting. Their determination was that the braces did not significantly change the rate or severity of injuries in kart crashes, and as such did not mandate them for their events. A company doing their own research into the effectiveness of a product is great, and expected, but independent test results are also very important in confirming that the results found by a manufacturer are correct. Your comment about holding the head up is interesting to me. I never experienced issues with having to hold my head up in a race, and I believe it was said somewhere else that if the brace is in contact with the helmet like that, it actually provides a point that the helmet can rotate around that isn’t central to the neck and cause strain on muscles, tendons, and possibly even vertebrae in the neck if there is a side impact with the kart. Does your design look at that factor in the brace? What testing specifically have you done for the development in your product? It has more vad points the good point about it But im not going to go on as the hans device is not designed for karting so no point discussing it. It’s not the device being discussed perse, but the process to determine its efficacy. The FIA looked into HANS (for cars) as well as “neck collars” for Karting. Not for the same applications (Yes they are totally different devices with different applications) but to judge their efficacy for their proposed use. To be clear, I don’t think anyone is suggesting what you are working on is “unsafe” in any way at all. It’s more about understanding how you came to the conclusion that it’s safer than others and having a conversation around that. I’ve used a foam brace since I’ve started karting, occasionally wouldn’t wear it during practice because it’s very uncomfortable. Just bought an EVS R4K for this season because I wanted something better and more comfortable. To me, the neck brace logic makes sense. That being said everyone has their own (usually strong one side or the other) opinion. It’s a personal decision that shouldn’t be mandated by any governing body. I don’t agree. If its deemed a safety improvement that reduces risk then sure it should be mandated. Like a helmet or kart suit is. The thing is none of them have been deemed to offer an improvement by an independent body. Somewhere in this thread its discussed that a foam brace may in fact increase injury due to pivoting the neck around the foam and hyper extending the spine. Should add I’m talking about the typical foam braces, not like the one Kieran is talking about. IKF just made them optional for senior classes. I think they’re pretty effective at preventing sunburn. Aside from that, is a collar that spreads out the force from an impact across your whole collarbone going to do anything? You can change the shear force distribution but the bending moment is the same and that’s an awfully thin beam. Are you a BMX racer, downhill mountain biker, or motorcyclist? 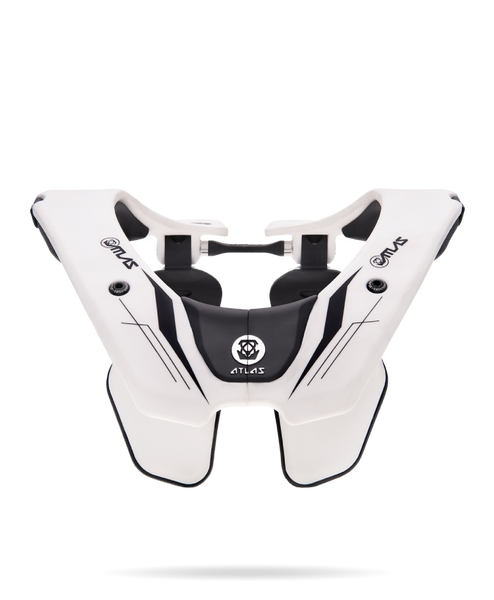 Durable yet flexible, this MX neck brace provides maximum comfort and mobility. Order yours now! Is anyone familiar with Atlas? Update: I just bought one. Cheaper than a neck injury. brake failure caused my son to fly thru a barrier and flip multiple times. Valhalla360 and ribtect worked like a charm. When deciding what to use to save your neck, get something other than one of those spongy neck donuts. What does non-seated mean and how does that apply to a kart? They say certainly do not use it if you are strapped in, but a kart seems to fit somewhere between the limits they set. That’s some strange verbiage alright. I would have put motocross as at least semi seated. Non seated to me would have been something along the lines of water skiing or something. Coming to the karting world form the moto world I may be able to provide some insight. In the world of moto we saw neck braces become the fad around 2007-2010. Why not everyone said. A brace for your neck seemed like a good idea. In the meantime questions were arising to the manufacturers to provide detailed independent studies that proved their product actually would be preventative or could help out in the case of a neck injury. These results were never provided by any of the manufacturers, Leatte, Atlas, EVS, none of them submitted research to say their product was even marginally effective. To this day no research has been provided and the fad of neck braces has disappeared almost entirely from Motocross. Many riders have gone public with comments how neck braces have contributed to back and neck injuries rather than prevented them. Independent research has suggested that in the event of a motocross crash. The bodies natural defense is to tuck your chin to your shoulder to help roll in a crash and not be a lawn dart when going over the bars. Same as flying out of the seat of a go kart. Most argue now days that wearing a brace will prevent you from being able to tuck your head when flying forward making you a lawn dart. When you impact the ground. The neck brace dissipates impact throughout your vertebrate and shoulders but if that helps or hurts, no one knows and its never been proven. I found it strange that when i switched to karting I saw more people wearing neck braces at the go kart track then I did at the motocross track. These braces are designed for a lawn dart situation. I.E coming out of the kart and flying head first. If you hit the wall and suddenly stop even the manufacturers will tell you they do not provide head and neck restraint for a sudden stop. I hope this helps and provides some insight. It boils down to the lack of research and the lack of cooperation by these companies to release their product for independent testing. If you watch a pro motocross or supercross race, only the riders who are sponsored by brace companies continue to wear them. Forgot to add that wearing a brace will severely limit your ability to look side to side when driving the kart. Lots of information on this subject if you go read the mx forums and do a google search. Interesting. They are required by our club for everyone, whereas rib protection is only required for young kids. I’ve been saying this for years in karting, and everyone just jumps on the “its better then nothing bandwagon”. Its going to take one back injury and someone will sue the crap out a manufacturer and they’ll disappear. Random account of “i didn’t get an injury” mean nothing, I have rolled over 3 times and never hurt my neck. Therefore I believe i’m better without.